The House Appropriations Committee released a report Tuesday that recommends eliminating all funding for the Eisenhower Memorial for fiscal 2017. The report, which provides guidance for the $32 billion spending bill for environment and interior programs, includes language that would eliminate funding for the Eisenhower Memorial Commission, which oversees the effort to build architect Frank Gehry’s memorial to President Dwight Eisenhower. "The Commission’s continued unwillingness to entertain sensible revisions to the memorial design, as suggested by the Eisenhower family and others, to more accurately capture the essence and reflect the legacy of Eisenhower, has resulted in unnecessary and unfortunate delays," the committee report states. Language to eliminate the commission’s funding was included in last year’s bill, but the final version of the bill included $1 million to cover the commission’s operating expenses. This year’s report stated the committee was withholding funding out of concern the Eisenhower commission was not taking into account concerns raised by important stakeholders, including the Eisenhower family. The report did not repeat its call for a full "reset" to the project with a new design competition open to the public. However, it did reaffirm the need "to replace the Commission staff with professionals committed to seeking common ground with the Eisenhower family, Congress, and others." The committee wrote that it would be "willing to consider discretionary appropriations to support memorial construction" if new staff members were installed at the commission. Opponents of the Gehry design hailed the report as a victory. "The bill report is a great victory for opponents of Gehry's grandiose design," said Justin Shubow, president of the National Civic Art Society. A spokesperson for the Eisenhower Memorial Committee said in a statement that Congress did not take into account the progress it had made toward completing the memorial. "The House Interior Appropriations Committee’s draft for the FY2017 Interior and Environment Appropriations Bill does not recognize the significant progress the National Eisenhower Memorial has made in the past year," said Chris Cimko, the spokesperson. "The design is approved and shovel-ready. Private fundraising is one-third of the way toward its goal." Congress has withheld construction funds for the memorial since 2012 due to the controversy over Gehry’s design, which has included public criticism from members of the Eisenhower family. 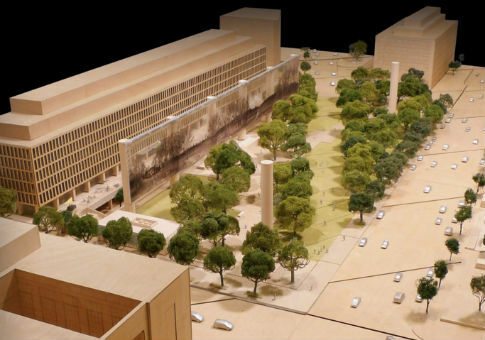 "We as a family cannot support the Eisenhower Memorial as currently designed—in concept, scope, or scale," the Eisenhower family wrote in 2012, which was the last time the family commented publicly on the matter. Congress has continued to allocate funds to cover the commission’s operating expenses. This allocation dropped from $2 million to $1 million in fiscal 2013 and would be eliminated by the proposed bill. The bill extends a provision requiring the commission to secure all necessary funds before beginning construction on the memorial. The provision has created a standoff between Congress and the commission, which is well short of the almost $150 million necessary to build the memorial. Private fundraising efforts by the commission have produced lackluster results, with roughly $5 million raised since 2012. The commission claims to have an additional $2.5 million in pledges from private donors.